St Willibrord was a Saxon from Northumbria. He converted to Christianity, dedicated his life to God’s service and entered the Abbey of Ripon in England. 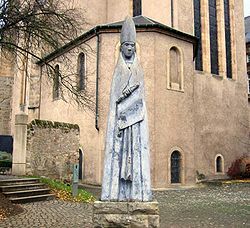 St Willibrord later transferred to the Benedictines and spent the following twelve years studying at the Abbey of Rathmelsigi; being influenced by St Wilfrid and St Egbert. With a group of eleven others, St Willibrord was sent to Northern Europe to convert the then pagans. He was consecrated Bishop of the Frisians and counted as the first Bishop of Utrecht, Holland. He established many Abbeys, Monasteries and Churches. In 716, St Willibrord was forced to flee Frisia when the area was overrun by pagans who killed many missionaries but, a few years later, he returned to continue his great ministry. St Willibrord’s Feast Day is the 7th November. He is the Patron Saint of Luxembourg and the Netherlands, as well as, epileptic sufferers. Be our shield in the path of danger and guide us to the Gospel of the Risen Jesus.